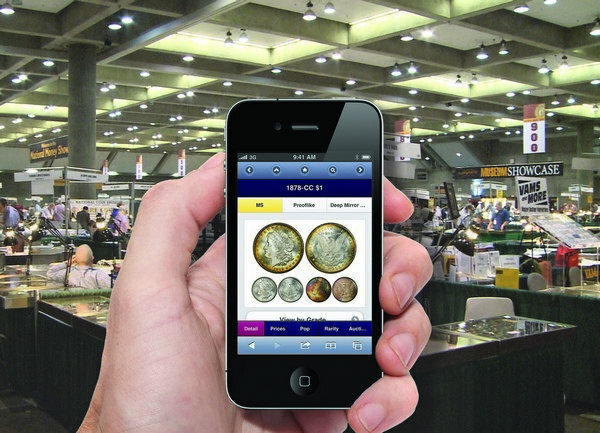 (Rosemont, Illinois) – PCGS Mobile CoinFacts, a new application that lets smart phone users instantly access all the historical numismatic information and crystal-clear coin images from the extensive PCGS CoinFacts database, will be available free to everyone for a ten-day trial period, August 12 - 20, 2011. After that, this indispensable app will then be available free only for those with a PCGS CoinFacts subscription. PCGS CoinFacts is the Internet’s most comprehensive source for information for over 30,000 United States coins, including current prices, auction records, population and images. All the information and photos hosted on the PCGS CoinFacts website are now immediately available to subscribers on any smart phone, and accessible anywhere the phone works. “Imagine being at a coin show or an auction and being able to instantly look up coin pricing information, population data and recent auction prices realized about the coin you’re thinking about buying. Of course, this app will be helpful when selling coins as well. We’ve tried to make this as easy to use as possible,” said Willis. PCGS Mobile CoinFacts will be introduced by PCGS at the American Numismatic Association Chicago World’s Fair of Money, August 16 - 20, 2011. A Beta version of the app will be available free at m.pcgscoinfacts.com for anyone with a smart phone to personally sample between August 12 and 20. Additional information will be available at the PCGS booth, #400, during the convention. “When you’re buying or selling coins, the person with the most current information is usually the one who’s most successful. Now you can get essential, up-to-date information from PCGS CoinFacts with just a few clicks on any smart phone,” said Willis. « What's Really on the U.S. Dollar Bill?